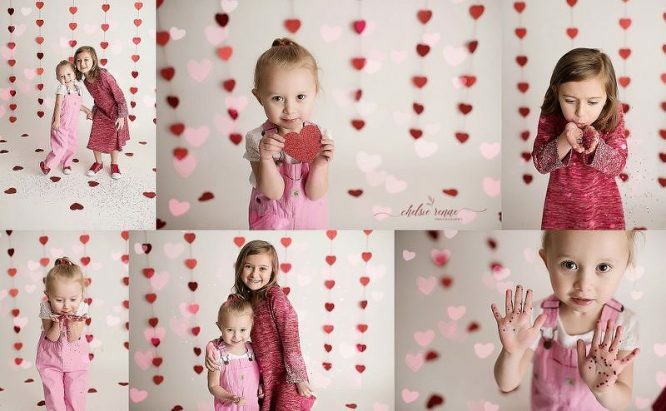 Valentine’s Day Mini Sessions are coming up! Valentines Day glitter mini’s will include 5 edited images in your online gallery with the option to purchase any additional images. Sessions will take place at the studio in Nunda on February 2nd and 9th, and last 15 minutes plus clean up. There are limited spaces available so be sure to book your Valentine’s Day Mini Session today. 1 | Please be right on time for your session. Don’t come early because that can be a distraction from the session that’s in progress, and please don’t be late because we only have 15 minutes together. If your late it will cut into the amount of images I will be able to capture during our short time together. If your late, you will have to return at the end of the day for your session, as to not throw off the rest of the minis that are scheduled. 2 | Only bring the people being photographed to your session. Extra people create a distraction. 3 | If your child naps on the way to your mini session, please give them enough time to wake up and be comfortable before coming into the studio. I always recommend bringing some baby wipes, to give your child a fresh and clean face before photos. Remember to stay calm during your session. If your kiddos are acting up please calmly correct their behavior without yelling. I know this can be easier said then done at times, but from my experience, yelling wont help, this only upsets them more. There will be lights set up throughout my studio, to avoid children getting hurt, please make sure they are not running around. I appreciate your cooperation, I want our short time together to be as productive as possible. Valentine’s Day is such a fun holiday especially for kids. Have fun with their sweet little outfits for this special day. I recommend staying away from graphics and too many patterns. Simple is best and sticking to just a few solid colors. Colors that will look great with the Valentine’s Day set up are white, cream, denim, red, pink, and grey. Below are some great example outfits, and don’t forget about shoes and accessories. If you have any questions about the upcoming Valentine’s Day Mini Sessions, click here to contact me. Book your session today.